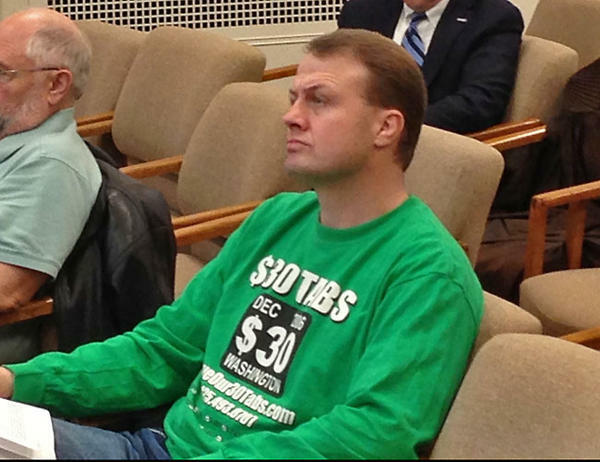 In this file photo, Tim Eyman sits in a legislative committee hearing. First, he was caught on store surveillance allegedly stealing a $70 office chair. Now Washington anti-tax activist Tim Eyman has produced his own video. It shows him returning to the scene of the alleged crime. In the nearly 10-minute video uploaded to YouTube, Eyman is seen in the parking lot of the Office Depot in Lacey, Washington near Olympia. Addressing the camera, Eyman explains he’s just returned from vacation in Florida and has the chair he’s accused of stealing in the back of his SUV. “Gonna offer to either pay for it or return it, but frankly I want to pay for it because I want the chair,” Eyman says. The camera follows Eyman as he heads into the store. There, he's met by the manager, who is not happy about the camera and isn’t interested in Eyman’s offer. “But I can’t pay for it here?” Eyman asks. Before heading to the police department, Eyman stages an “unveiling” in the parking lot. It’s a cushy leather office chair. The kind an executive might have. Eyman’s alleged theft happened last week when he came to Olympia to testify on a bill regarding legislative public records. Eyman wore a bright red “Let the Voters Decide” shirt. After he testified, he went to the Office Depot where the chair in question was parked at the entryway. Store video shows Eyman — still in the bright shirt — testing out the chair, spinning in it and then rolling it out of the store without paying. A few minutes later Eyman re-enters the store. He’s later seen departing the store while talking on the phone. A clerk follows him out, pushing a dolly with what appears to be two computer printers. Eyman says he intended to pay for the chair — along with the other purchases he made — but got distracted by the phone call and forgot. “Total mistake, didn’t mean to do it, wasn’t intentional,” Eyman says in his video. Lacey prosecutors have charged Eyman with misdemeanor theft. He’s also currently embroiled in a years-long campaign finance lawsuit brought by the attorney general’s office. Eyman blames that lawsuit for putting him into bankruptcy and ending his marriage. After dropping by the Office Depot, the next stop in Eyman’s video is the Lacey Police Department. While he waits for detectives, Eyman sits in the chair and discusses his recent vacation to Orlando with his 10-year-old daughter. “Highlight: Universal Studios, all day long, 12 hours, Harry Potter unlimited. We just went on every ride multiple times,” Eyman says. When the detectives arrive, Eyman apologizes for the "hassle" and turns over the chair. “We’ll definitely take it, we’ll log it into evidence,” one of the detective tells him. The video ends with Eyman returning to Office Depot to buy another chair because he says he needs one for his office. Earlier this year, Eyman qualified a $30 car tabs initiative to the Legislature.